A device that offers mobility to people who have great difficulty walking, that is limited to a maximum speed of 8mph, and poses little or no danger (at least relative to other forms of transport like the private car) should never be framed as a problem. Yet somehow the BBC contrived to do so on Wednesday night, with a programme entitled The Trouble with Mobility Scooters. Throughout the programme the visuals, music and editing strove to create an impression of uncontrolled, reckless or ‘lawless’ behaviour on the part of scooter users. Statistic-free statements like ‘few mobility scooter users give way to pedestrians’ (really? ), or that ‘pedestrians on pavements are a common victim of scooter users’ (well, how common?) were a repeated feature of the programme. The other striking parallel – an unsurprising one, given that both mobility scooters and cycling are minority modes of transport, that are not catered for properly on our roads and streets – was in the way mobility scooters are seen as a problem, wherever they are. And just as the British ‘solution’ to the problems posed by ‘cyclists’ as a group typically involves MOAR TRAINING in an attempt to get us to behave, so the BBC programme would have us believe that the ‘problem’ of mobility scooters can be solved with – yes – training. At no point in the programme was it suggested, or even hinted at, that the physical environment of our roads and streets could be adjusted, to minimise conflict between pedestrians and scooter users, and between motor traffic and scooter users. The obvious answer to the ‘alien’ issue – that mobility scooters aren’t at home on pavements or the road – is to give mobility scooters their own space, one that could be shared with cycling (fancy that – two problems solved for the price of one). But despite the issue being framed so plainly (if accidentally), the programme didn’t stop to consider it. The problem, as with cycling, lay with the users and their behaviour, not with the physical environment, or with the danger posed by motor traffic itself. 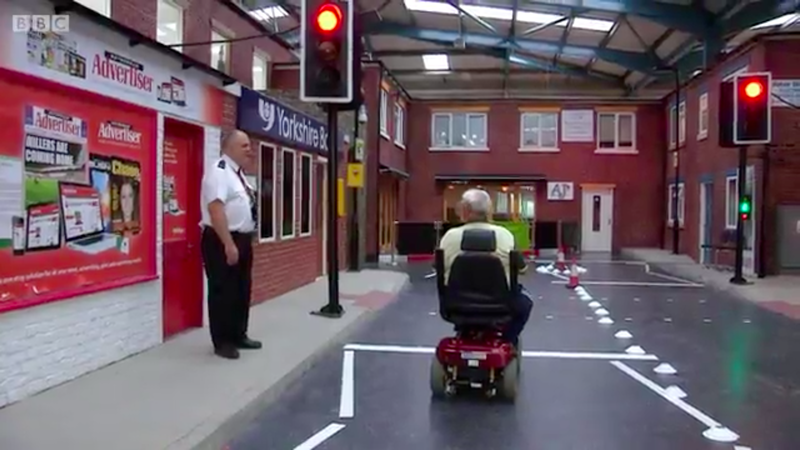 Witness the patronising ‘red light’ test, as a trainer says ‘well done!’ to a man stopping for a red light in a test centre, which had me wincing with recognition. The absurdity of this kind of test – given that mobility scooters aren’t really a vehicle, and can use the crossing themselves – didn’t appear to occur to the trainers. But how many? There are 330,000 users in Britain – at what rate are they injuring people? The programme didn’t supply any answers, merely content to create a vague impression of a ‘problem’, stripped of context, without even the merest hint of a comparison between the genuine danger posed by motor traffic in our towns and cities, and these small, slow vehicles. Later there was the pitiful sight of an 84-year-old man effectively being admonished for wishing to have some independent mobility, despite his failing eyesight. The idea of making our streets safe for people like this was not considered by this programme, which viewed this man as a danger, showing him ‘jumping’ a red light. Nor did it consider the consequences of denying him the use of a mobility scooter – the prospect of being housebound. A strong presence in the programme was a campaigner for a compulsory test for mobility scooter users. 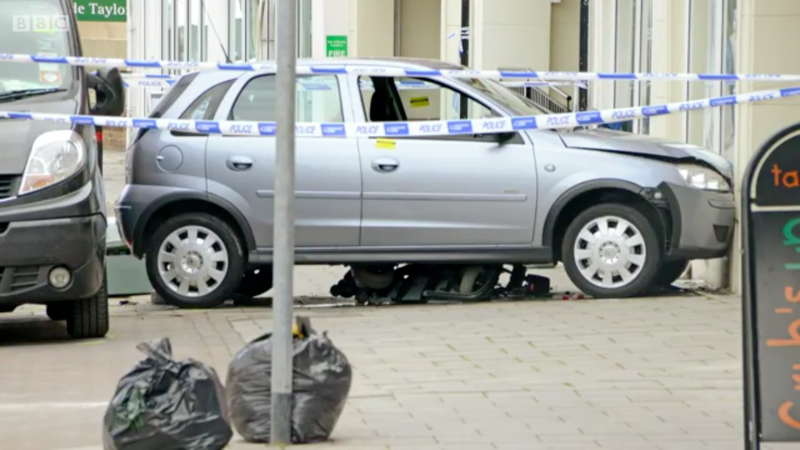 Her son had been knocked down by a mobility scooter user. Intriguingly, just as (apparently) everyone seems to have been ‘nearly knocked down’ by a cyclist on the pavement, so this campaigner claimed that nearly everyone she knows ‘knows someone who has been hit by a scooter’. Ah, precious anecdote. This isn’t to deny that collisions can, and do, happen, and can be serious, but the single-minded focus on training, at the expense of any context about the actual statistical danger being posed by scooters, or even more importantly the adjustment of the physical environment so that scooters and pedestrians aren’t forced to share the same absurdly narrow pavements, struck me as completely absurd. In describing the incident in which her son was hit, the campaigner argued that the person on the mobility scooter ‘shouldn’t have been on the pavement’ on a one-way road, which of course hints at the real underlying problem – but the programme failed to address it, or indeed even to recognise it. The campaigner also argued that scooters travelling at 4mph in a pedestrian precinct were ‘too fast’, apparently because ‘we don’t walk at 4mph’. I suppose that’s a claim that technically can be made, but the difference between this speed and a fast walking speed is so marginal a sensible programme would have asked her what speed she believed to be acceptable, or indeed raised why scooters are limited to 4mph in pedestrian environments in the first place. This programme didn’t. The problems with our physical environment were even presented to the programme makers on a plate as they followed a mother with multiple sclerosis. 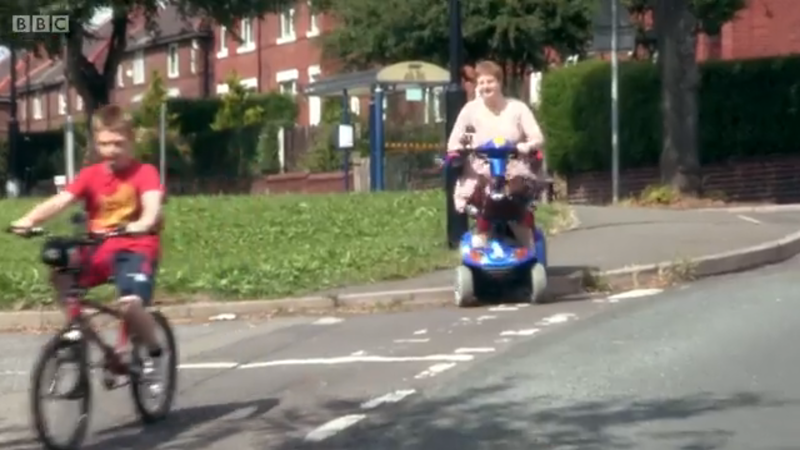 It was painfully obvious – to me at least – that her problems with getting about on her scooter were principally due to the awfulness of the physical environment, not due to any lack of training, but again the programme chose to focus entirely on the latter. 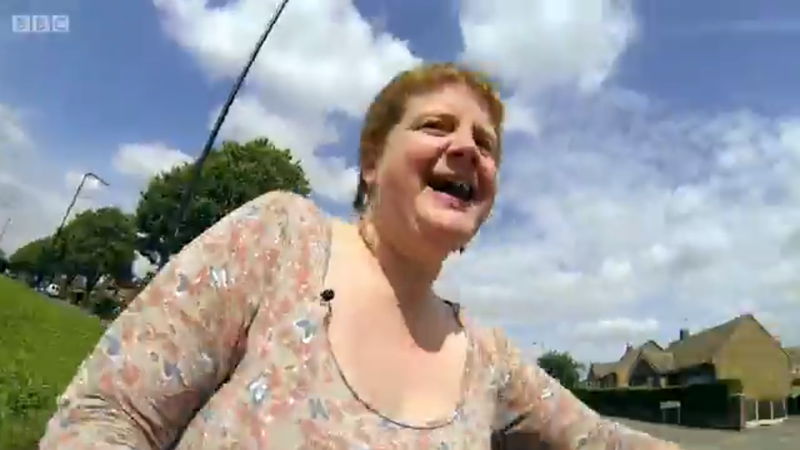 is framed by the programme as some kind of demonstration of her incompetence, a dashcam filming her wobbling about, out of control. The programme makers evidently have no idea that junctions need not be designed like this – that they could be easy to traverse for people with mobility problems. Instead they choose to segue into a piece about this mother realising she needs to… get some training! Well, he would say that, wouldn’t he? Unfortunately this is all the programme has to say on the matter, a farcical treatment of the issue. … we go straight back to our compulsory proficiency test campaigner, who uses the deaths of these people to argue her case, which is more than slightly distasteful, given that there is no analysis of how these deaths happened, or whether compulsory training would have made any difference at all. We have no immediate plans to make [testing] mandatory, because we lack comprehensive evidence that the use of a mobility scooter vehicle as a whole is a major public safety concern. This is the only evidence-based piece of discussion in the entire programme. The campaigner is infuriated that the Department for Transport, rather than using her anecdotes and small petition as a basis for policy, have chosen instead to rely on actual evidence – but the silliness of her position is, again, unchallenged. Her concerns are presented as well-founded and serious, with silence, followed by solemn music. A programme like this could have been a genuine opportunity to assess the problems of mobility in Britain for those who can’t drive a motor vehicle, or who choose not to. But instead we were served up dross, a patronising programme that ignored the serious issue of how a poor physical environment needlessly creates conflict, causing huge problems for a vast swathe of the population who are forced to choose between crap pavements and highly dangerous roads. Rather, it chose to ridicule some of its subjects, adding ‘wacky’ music to their attempts to get about safely, while striving, transparently, to present them as some kind of serious problem. The parallels with attitudes to cycling were unsurprising, given the similarities between these two modes of transport – ‘problematic’ only by virtue of the fact that they have been neglected and ignored. This entry was posted in Absurd transport solutions, Road safety, The media. Bookmark the permalink. Ah yes the BBC at it’s best. I despair. They’re turning into the Daily Mail. I think there’s often an underlying element of anti-disability sentiment in the way mobility scooters are regarded in this country; some people are very ready to judge their users as ‘just lazy’ or not disabled enough to justify them. If a person has a condition which limits their mobility, they’re expected to drive. Cuts to mobility allowances mean this just isn’t possible for a lot of people. Using a mobility scooter is a slightly weird, outlier form of transport that’s not a car and not walking, and therefore can’t be viewed in anything other than a negative light. The alternative to a scooter, for a lot of people, would mean even more social isolation and worsening health. It’s saddening because it’s entirely possible to substantially reduce conflict through design, and improve independence and health, but we just can’t seem to see it. A fair proportion of mobility scooter users wouldn’t be able to drive anyway – medical conditions, not enough upper body mobility, insufficiently fast reaction times – and even in our car-sick society and with the benefit of a blue badge, you can’t drive right up to the doorstep in most places. I’d actually like to see far more of these on our streets, to the point that they lose the stigma of being associated with ill health, infirmity and severe disability. If healthy, able-bodied people are too lazy to cycle two or three miles, and can’t organise their lives sufficiently to make time to walk it, I’d much rather they used a light, clean, quiet electric vehicle which allows them to stop and talk to people, doesn’t come with a ton of motorway-grade metal armour, takes up very little space and endangers almost nobody. This is one reason why I don’t have a TV – I don’t want to give the BBC any money. In some ways it is a lot worse than the (accurate and correct) picture you portray. I think you miss out on the fact that the “solutions” to the alleged “problem” of mobility scooters – which as you correctly say is exaggerated and misplaced – are essentially getting the “problem people” TO DO WHAT MOTORISTS DO – e.g. be licensed and have compulsory insurance. Leaving aside the points you make, I see a key issue as being this one. It is based on the idea that proper regulation (even if scooter users needed it, which I don’t think they do) is what motorists have. My view, as I have argued for twenty five years, is that third party insurance, the “test” and vehicle excise duty area actually pseudo-regulations which are part of the problems of motor danger and car-centred transport policy. Another point: Quite often I come across cases where an elderly and/or disabled motorist has hurt or killed somebody in a road collision. These people tend to get a fair chunk of media led public sympathy: any suggestion that they have the law properly enforced on them, deterrent sentencing applied etc. is angrily contested on the basis that the elderly/disabled motorist s dependent on their car and can’t be banned whatever they have done, some kind of victim because of their age/disability etc. This sympathy somehow vanishes when the elderly/disabled person is using a mobility scooter with rather less destructive potential than a car, even when on the footway. Finally, the self-righteous victim will always be sympathised with if they do not threaten the status quo. The lady you quote (luckily I didn’t see this drivel and just base myself on your account) is exactly the same as those pushing for cycle helmets. The same level of evidence base and a feeling of entitlement that everybody should accept their agenda based on their own (alleged) experiences. That’s car culture for you. I can only say I don’t really like these scooters because they need a really smooth surface to be driven safely. Just two days ago, I saw one toppling when the driver tried to cross the road; he probably misjudged the angle he made while mounting the curb. As said, the physical environment needs to be right, otherwise the scooter is a menace to both driver and others. In what way is a mobility scooter a “menace”? How many people have been killed by someone using one? How many people have been injured by someone using one? The scooter is not the menace – the designers of the environment are. It is actually VERY simple to ensure that the environment is good for vulnerable users. It just isn’t done. I expect they have a schedule to fill and a budget to stick to – this is “cheap as chips” film-making and even cheaper when you don’t set yourself the task of research and evidence gathering. Just pick a taxi-driver rant and set it to mood music. Lazy poor programme making. Disappointed in the BBC. To suggest training for the mobility scooter user is the issue when the car is bonnet first in the wall is shocking. They should be embarrassed. The wall did not have its traffic training either, I’ve been told. So there you go. Hmmm, yes and no on the post’s points. The programme was certainly fast and loose stuff. And your point about the lack of knowledge that urban design can be changed is very powerful (because it’s true). However, I think you’re on much thinner ice in defending the right to independence almost at any costs. There come points at which people are not suitable to operate mobility scooters, bicycles, cars, lawnmowers etc. These points are different for each individual and each machine. But there is a balance to be struck, and I don’t think it’s unreasonable for the prog to point out the lack of restrictions on who can use these and where they can be used. There is a relatively complex set of attitudinal problems going on there – remember the lady in the prog who asserted that her right to scooter down the pavement trumped the right of the boy who was run over to be on the pavement? Transpose that to bicycle vs the world and it doesn’t feel too comfortable. Anecdote shouldn’t be totally dismissed either. It has its place, especially as it drives so many perceptions – I think you have to recognise that while pushing back against it. For example, I have cycled past or around many mobility scooters with no problem over the years. The only one that sticks in my mind is the incident where, down a long straight and wide path, the scooter driver deliberately drove towards me, even when I changed direction (twice), doing all he could to make a collision more likely. Sounds crazy, but that’s what happened. Inevitably that colours my perception on the issue. Great post about Poynton yesterday. Glad I didn’t watch this programme. I work for a disability charity and regularly speak to people who rely on their scooters to get about. Without them, they would be completely housebound. To paint them as a menace is just wrong. What if they’d made “the trouble with bicycles”? Sounds like they already have the script and soundtrack, they just need some new visuals. I thought the BBC was a government funded public broadcaster. It is hard to believe they would be able to put such a biased and politically incorrect program to air. The link does not allow viewing in Australia, so thanks for doing the freeze frames to help illustrate. Probably a good thing I can’t see the video, I would be tempted to throw a brick at the screen. The BBC is funded largely by TV licensing fees, with the remainder coming from flogging programmes to FOREIGN countries. AFAIK, only the World Service has ever been funded by HM Government. the iPlayer link will only work for a week anyway even if you live in the UK. If people are going to get this upset about mobility scooters trundling along at 8 mph, what will they say when some of those scooter users get electric bikes/trikes/quadricycles and start trundling along at 15 mph instead? I hope when I need one of these, I’ll be able to get the high performance, offroad, tilting version. Good posting and much needed. One positive point to counter the generally negative portrayal of the general attitudes is that I noticed on a visit to Swansea that shoppers can hire a mobility scooter quite close to the bus station and the town centre for shopping trips without the expense of hiring one. This is quite possibly true of other cities & towns too. It suggests that they are becoming firmly established despite the negative approach of self-consciously cool journalists and filmmakers. Also one response to the suggestion in the comment that anecdotes are important. Yes, but I think we should realise that the reaction that creates the anecdotes also needs to be taken into account. To a large degree the negative reaction to cyclists & mobility scooter users is because of the novelty of interaction. Cycling was effectively wiped off our roads by road design, socially-approved driving style and civil service/lpolice/judicial indifference to cyclist casualty rates and cycling has only marginally rebounded in a few places, notably London, in recent years. 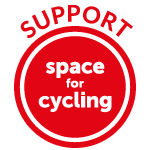 As AEARAB has established in many postings, all round the place people now choose to cycle on the pavement, despite the problems, rather than mix it with angry motor traffic on unforgiving road designs. This has led to an increase in cyclist/pedestrian interactions on the pavements in an environment where there is no established culture for handling those interactions and as a result they are often mishandled. The same is happening with mobility scooters as another form of vehicle/pedestrian interaction is introduced onto our pavements where pedestrians have traditionally been king (apart from parked cars/vans etc and motors wanting to cross the pavement to enter/leave a driveway etc). So negative anecdotes about cyclists and mobility scooters are really often an expression of annoyance at change, rather than a serious reflection of objective risk. The BBC, like many large organisations, is institutionally motorist. This affects the way they view the world. They missed a trick, though: where were the calls for compulsory mobility-scooter helmets?